A Classic and Southern Fried Okra Recipe -- the flavor is amazing, and the fresh okra comes out with a beautiful golden brown color with a perfectly crunchy texture! This is one of the best okra recipes around!!! Season okra with salt and pepper. Add eggs to a separate small bowl. Combine flour, cornmeal, seasoned bread crumbs and paprika into another small bowl and whisk together. 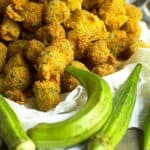 Begin by dipping okra into cornmeal and flour coating. Next add okra to eggs coating on all sides. Lastly dip back into the coating and set aside okra on baking sheet. Repeat dredging process until all okra is ready. Fry okra until golden brown and drain on paper towels.